Donations to support Back to Natives Restoration Mission! Donations to support Back to Natives Restoration Mission! You set the amount, as any amount you can afford to donate makes a huge difference for habitat restoraton, environmental education, community education and community service opportunities! Back to Natives Restoration, in a cooperative agreement with the Cleveland National Forest, provides hands on habitat restoration training over the course of a 7 week training program. Each training session focused on specific aspects of the restoration process from tool and trail safety training, to native and non-native plant identification, proper site entry/exit protocol as well as mechanical/physical abatement techniques to reduce soil disturbance and possible weed seed germination. Graduates of this course are certified to lead groups of volunteers in habitat restoration projects. This is a REAL CLASS. Expect weekly quizzes, homework and a final exam! restoration trainingWhere: Field Labs will be in the Cleveland National Forest and other locations TBA within Orange County. Who’s invited: Anyone interested in hiking Orange County trails to identify invasive plants, remove them when possible, and report them when assistance is needed. Staff and Volunteers from all wildland agencies, organizations and non-profits are also welcome to participate, and then share the knowledge and skills gained to restore their own lands. Age requirement: 16 years and older. Individuals younger than 18 years of age must be accompanied by a parent. 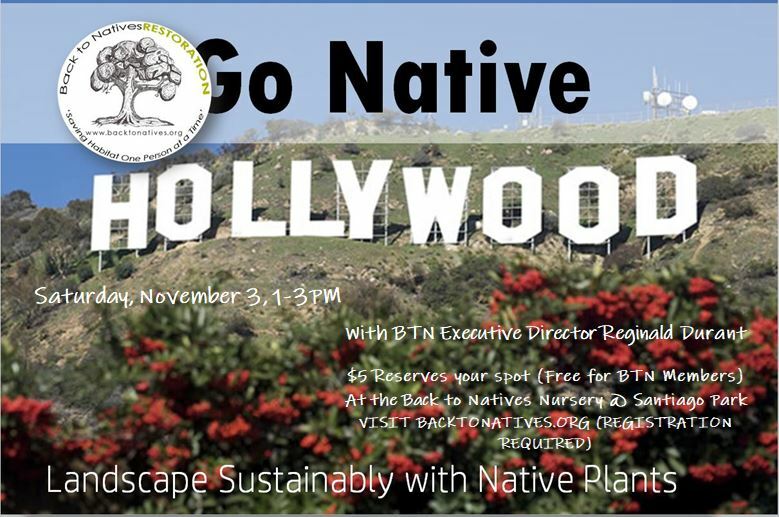 Volunteers: $150.00 & two hours of time spent volunteering with Back to Natives monthly for a year after graduation. Certification received AFTER volunteer hours are completed. Agency/organization staff: $300.00. Certification received IMMEDIATELY upon graduation. Why: Ecological restoration is a means of sustaining the diversity of life on Earth and reestablishing healthy ecosystems. 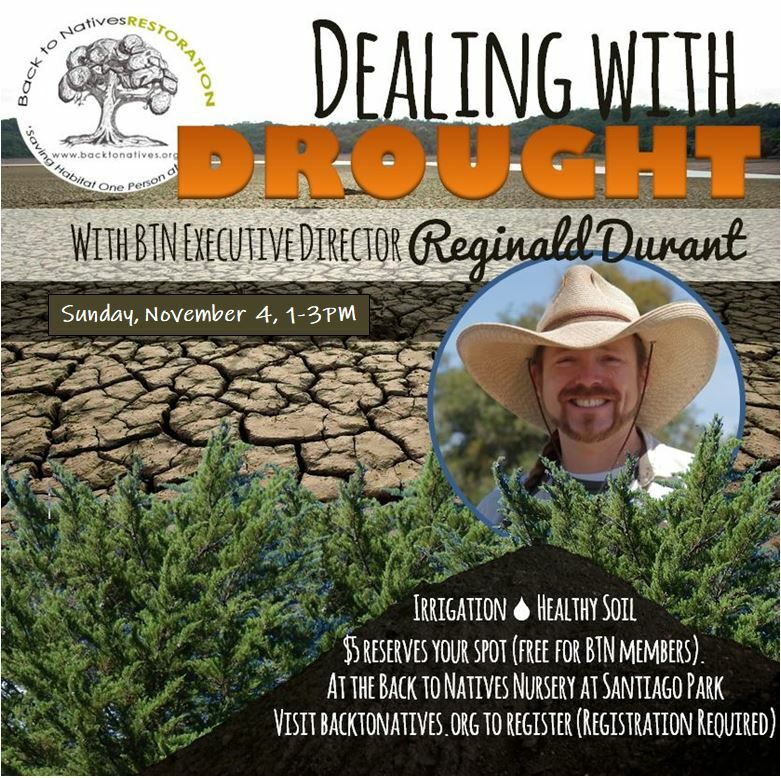 This program is for those interested in the restoration and conservation of Orange County wildlands. Successful habitat restoration ensures that native species are protected while non-native species are removed efficiently, and with minimal human impact to the site. This program will acquaint participants with non-chemical, low impact weed removal methods. 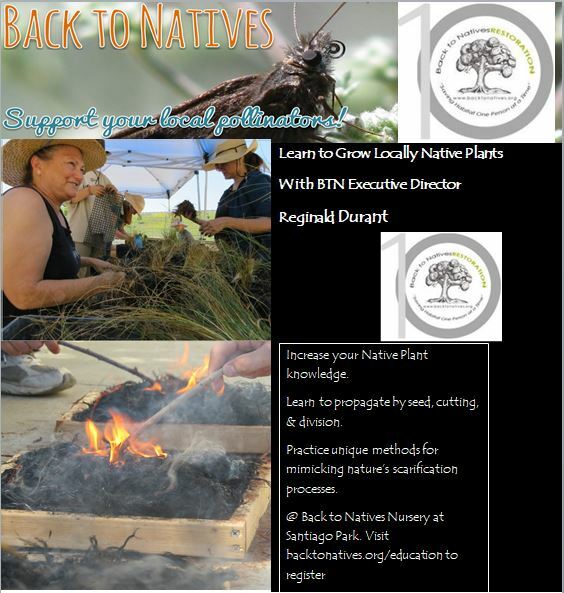 Back to Natives Restoration, in a cooperative agreement with the Cleveland National Forest, provides hands on refresher class and Exam for the Restoration Training Program. This one day refresher class will focus on specific key aspects of the restoration process from tool and trail safety training, to native and non-native plant identification, proper site entry/exit protocol as well as mechanical/physical abatement techniques to reduce soil disturbance and possible weed seed germination. Graduates of this course are certified to lead groups of volunteers in habitat restoration projects, so annual Continuing Education Units(CEUs) and a refresher course is required every two years to maintain certification recognition. This is a REAL CLASS to RENEW YOU CERTIFICATION. Expect a final exam! Class Review and Recertification Exam will be at downtown Anaheim Community Center, from 12Noon to 4PM. Please be prepared to take notes and the EXAM! We recommend a sack lunch so you can head directly to the classroom!